When do people buy using their smartphones? What’s the best time to schedule your mobile promos and sales? Undoubtedly, the trend is that mobile shopping is still gaining in strength but what was the exact growth of the market in 2014? Does the holiday season play a role? Opera Software provides answers to all of these questions. The findings are based on anonymous research of 270 million Opera browser users with the help of data aggregation. While Mondays are the most popular day for laptop and desktop sales, with a gradually falling trend for the rest of the week, the situation is quite the opposite for mobile applications. 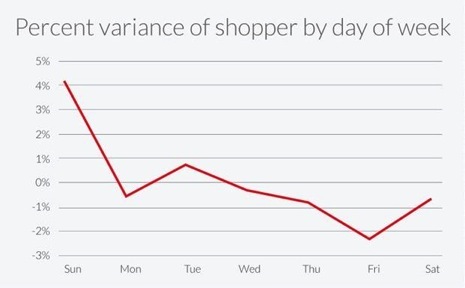 Sunday is the top day for mobile shoppers while the least activity is seen on Fridays.